Acid Kuba Grande is a fat, 6x60 version of the original Kuba Kuba, made from the same blend of herbal-infused premium tobaccos. These big-ring flavor blasters bring you even more of that awesomely creamy and aromatic Acid Blue taste that you crave. Thewife liked them so much I had to buy the largest box offered...X 2! If you like th eAcid cigars, especially the kuba kubas, but prefer a bigger longer lasting cigar, then you will be quite excited. These are the answer. I have been in love with the kuba kuba cigars for a long time. But like a longer lasting one. They have it. You won't be disappointed. If you have never tried the Kuba Kuba's, then you need to check these out, they are one of my favorites. I thought the Acid Kuba Grande would be a longer enjoyment of the smaller Acid Kuba Kuba. Actually, the Kuba Grande has bitter after taste that creeps up rapidly. I will stick to the Kuba Kuba. Kuba Grande's are one of my favorites. The infused flavors may not be for everyone, but they add a subtle twist to an after-dinner cigar experience. The infused oils will overwhelm any subtleties in the filler, making for a fairly one-dimensional smoke. The BCP two box deal is the absolute best around for these bad boys. I love Acid Cigars and the Kuba Grande is my favorite. I searched high and low for a great deal on boxes of the Grande and this is by far the best deal out there. The cigars are so pleasant to smoke and are the only ones that the wife doesnt mind sitting near me! Bigger and longer lasting than it's smaller counter part the Kuba Kuba. Just riight for 18 holes of golf or when time is not an issue. i feel it has the same great taste as the Kuba Kuba only in a bigger bolder package. You wont go wrong with either. Pleasing taste and aroma. I find the delivery and convenience better than local stores as I know that I can get what I want. Quality and delivery are great. Fast shipping, It came in a great packaging and condition. I will definitely shop again through them. I order from Best Cigar for my husband several times throughout the year. We are always thrilled. The order is always shipped same day and the cigars are perfect! Awesome cigars. Some of the best quality I have ever received from an on line store. By far one of the best smokes in the market. They are smooth and have a fantastic taste. I highly recommend them. Great value. Of course a great smoke. Great smoke. Not too sweet but aromatic to the point that people will ask you for one to spare. A well made flavored cigar. The unique aroma turns heads. Underlying leaves manage to mingle up with ceda overtones. This is a great smoke from Acid! Great flavor, consistent burn...worth every penny. This is one of the Best Cigars ever! The regular Kuba Kuba is my go to cigar but I purchased these for a change of pace. Best price I could find after looking for hours! Great deal, great website!!! 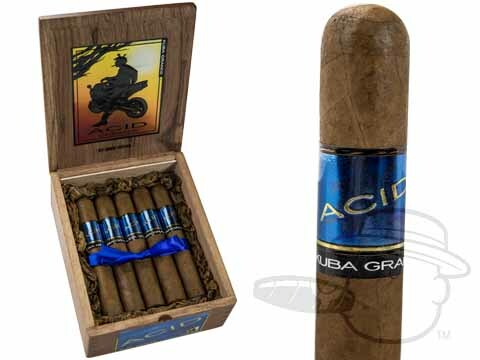 Acid Kuba Grande is rated 4.7 out of 5 based on 40 customer ratings.